In the last few months we’ve been treated to a couple of releases from Rockpile influenced performers such as The New Trocaderos (Kurt Baker, Geoff Palmer and Brad Marino). And while they’ve been extremely enjoyable, nothing substitutes for Dave Edmunds, Nick Lowe, Billy Bremner or Terry Williams. 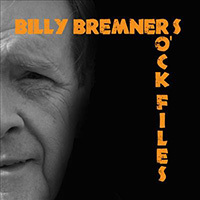 Billy Bremner’s latest release, Rock Files, went unnoticed by me for over 2 years until I accidentally stumbled upon it a few days ago. Better late than never, as they say. You’ll remember Bremner as the lead vocalist on “Heart” and the author of a classic Rockpile/Dave Edmunds song called “Trouble Boys” from Dave’s Trax on Wax 4 LP (1978). Or you may remember him for is UK hit “Loud Music in Cars” from his Will Birch produced LP entitled “Bash”. If so, you’ll be glad to hear that Bremner still sounds great, albeit a bit older – which is understandable as this is his first LP since 2006’s No Ifs, Buts or Maybes. Bremner follows the Rockpile recipe throughout this new release. He shows us a sense of humor on the opening track, “The Alligator and the Rockadile”, shows us some country boogie with “The Cocktail of the Year”, and gets serious with “My Life Has Stopped on Red”. Other favorite cuts include “Lie Detector”, “Bullies” and “She’s No Queen”. There are a couple of throwaway tunes here but for the most part, Rockpile fans will get plenty of enjoyment out of Bremner’s Rock Files. It’s available as an MP3 download through Amazon. Get it here.